The Techlink Recharge 12000 means business. Its 12,000mAh charge inside is truly huge for a portable battery, but it makes sense if you’re either traveling to remote areas, or you never, ever want to hunt for empty sockets in airports and cafes. We’re in the latter camp, mostly. Weighing 292g and measuring 145x85x20mm, the Techlink Recharge 12000 is larger and heavier than less capable batteries, but is it worth the extra effort? Absolutely it is – offering pro-quality power, a cheapo festival battery this is not. In our tests we managed to refuel an iPhone 5S (which has a Li-Po 1,560 mAh battery) from a measly 10% all the way 100% in 90 minutes via the 2.1-amp outlet. Crucially, it reached 60% in the first 30 minutes. At the end, the Techlink Recharge 12000 was still lighting-up four LEDs, so was near-on still fully-charged! Next came an iPad mini, about to conk-out on 3%. After an hour it was at 35%, and after the second hour it had reached 67% – and, at last, the Techlink Recharge 12000 was showing three LEDs. To fully-charge the iPad mini did take a further hour, but all of these timings were expected from previous battery tests. 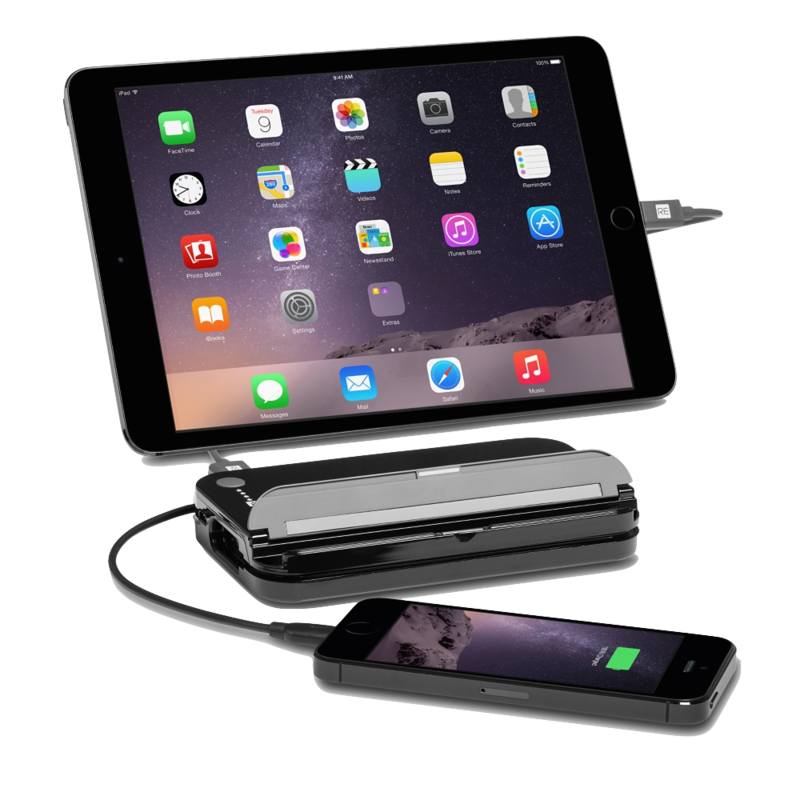 What’s really impressive is the capacity; I reckon the Techlink Recharge 12000 can, at the very least, manage three full recharges of an iPhone 5S, plus a couple of iPad mini recharges. Impressive stuff. It’s Apple ‘Made for iPhone’ approved and sold by Apple stores worldwide, so there’s no worries about compatibility with an iPhone (that’s crucial – some so-called iPhone accessories ‘just WILL NOT work’). The side has a 1.0-amp and 2.4-amp outputs, for phones and tablets respectively, while pressing a grey button on the front will give you a rating our of four for how much power is in the battery, shown by four LEDs. Considering the sheer size of the Techlink Recharge 12000, that battery indicator could do with a bit more detailed a breakdown. Incidentally, it’s rated to give a 90% charge even after 500 cycles. Now that’s a few times around the globe and back. That’s the essentials out of the way. Now for the killer design. Since they’re usually boring, boxy and bulky, a portable battery really needs a couple of extra features to make it stand out from the crowd. Some have a built-in LED torch. Errr … OK! Others offer to jump-start your car. Hmmm. The Techlink Recharge 12000 has two things; a flip-up ridge that you can lean a phone/tablet on for watching a film in angled splendour, and a channel around the exterior that can hide one of the include 12-inch cables. If you’re an Android-er, that’s fine – stash the microUSB cable in the Techlink Recharge 12000 and you can recharge both your phone and the battery on the go. However, if you’re using Apple, you need both cables; the Apple Lightning to recharge your phone, and the microUSB to recharge your phone. Whichever one you leave in the Techlink Recharge 12000, the other one has to go in a bag – and not get lost (unlikely). Either way this is a seriously impressive battery that should see you through any long-haul flight – and the bus journey home.